You’ll typically find athletes training on the court, field or track. But at the University of Iowa, you’ll also catch athletes grabbing lunch in the basement of the Iowa Memorial Union, sitting on the Capitol Lawn or listening attentively in a lecture in McBride Hall. Basically, Hawkeye athletes achieve excellence on and off the field. These student athletes are known for their inspirational stories from record-breaking throws to incredible recoveries to representing a small Iowa town. 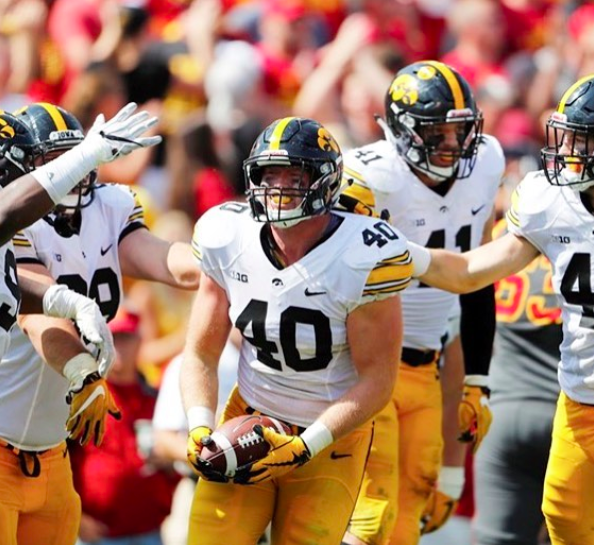 Iowa student athletes aren’t just campus celebrities—they’re campus heroes. Pro Tip: Student athletes never have enough time. Get to class and practice fast on the ultimate college scooter, the Wolf RX-50. Check out 10 inspiring Hawkeye athletes that beat the odds every day. 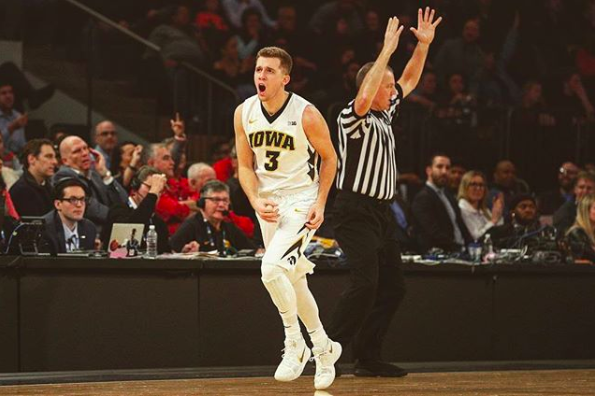 In the 2017-2018 season, Jordan Bohannon had the opportunity to break a Hawkeye Men’s Basketball record for consecutive free throws made. He purposefully missed what could have been his 35th consecutive free throw to uphold the record of a fallen Iowa athlete, Chris Street. 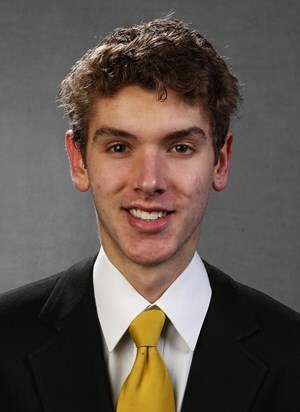 An Iowa basketball legend, Street died in a car accident at 20 years-old. “Missing the throw was a very honorable thing to do,” said University of Iowa sophomore IV West. The record is now shared by Bohannon and Street. Now a junior, Bohannon continues to dominate the court. He’s the sixth underclassman to earn the Chris Street award, and he earned the team’s Top Playmaker Award as a freshman and sophomore. In her freshman season, Kaji qualified for the 2017 NCAA Championships as a specialist on the beam. 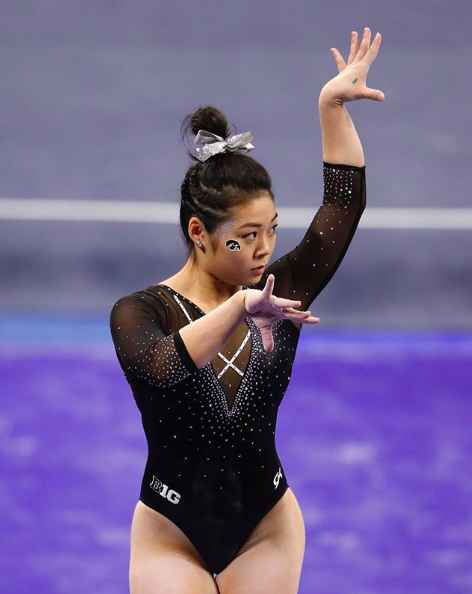 Kaji competed in the Canadian National Championship in 2011, 2012, 2014 and 2015, so needless to say, Iowa gymnastics got excited to see Kaji’s potential excel. Life threw Kaji a curveball. Three meets into her junior season, she tore her ACL. The injury only made her work harder and now Kaji’s back to competing with the Hawkeyes in the 2018-19 season. She scored a season-best on floor against the University of Michigan earlier in February. 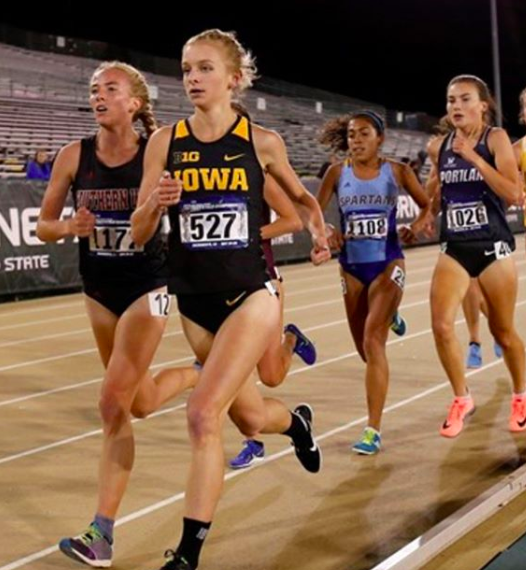 Andrea Shine walked on to the Hawkeye cross country team without a history on the track. Quickly proving herself by placing at the Big Ten Championships and running her season best 6000 meters at NCAA Regional, Shine started the 2017-18 season as Iowa’s top returning female and only female returnee from Hawkeyes’ all-time top 10. 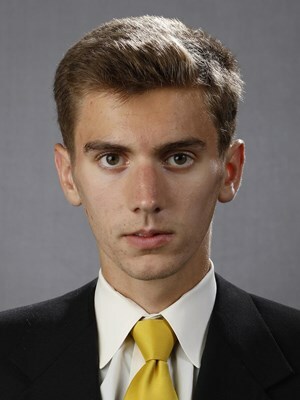 “Running is hard and Shine seems like a good representative for Iowa… not to mention she’s doing all this great athletic stuff with a really tough major, [microbiology],” said University of Iowa sophomore Matt Szarkowicz. Shine shows her campus that to succeed all you need is motivation and a lot of determination. Harold’s high school, Parker High School, knew her as a volleyball, basketball, and track and field star. As a freshman, Harold and her roommate decided to try rowing. She fell in love with the sport especially for its mental and physical challenge coupled with the amazing team spirit. “My cousin [a rower at the University of Texas] mentioned Harold to me, said she was a really nice person and a hell of a competitor,” said Szarkowicz. In the 2016-2017 season, Harold was the first Hawkeye in program history named the Big Ten Conference Co-Athlete of the Year. Harold’s story goes to show—if you just try, you may just succeed. 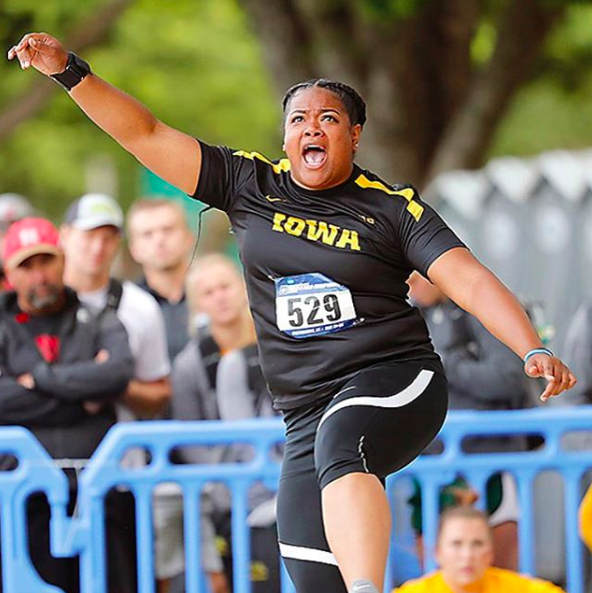 This humble Hawkeye won the Big Ten Conference discus title as a freshman, became first-team All-American and ranked fourth at the NCAA Championships in 2018. In new year and season, she continues to break personal and Hawkeye records. Tausaga broke Iowa’s weight-throw record for the third time this season at the Meyo Invitational in Nebraska. Unsurprisingly she placed first and scored an MVP for the meet. And if you think that she settles for just the win, think again. Tausaga hopes to meet a new milestone at every single meet this season and beyond. Need to get to the track faster than your feet can get you there? Check out MopedU Powersports near campus to check out the hottest Wolf Scooters. Jahisha Thomas almost went redshirt in January 2018 when a hamstring injury kept holding back her long jump. But Thomas refused to let it get the best of her. Instead, she focused on what she could change: diet, motivation, sleep and perspective. By the time the 2017-2018 season ended, Thomas placed second team All-American, 13th in long jump at the NCAA Championships and broke her own school record at the Tyson Invite, becoming Iowa’s highest placing All-American for long jump. “She is simply a professional who puts everything into her craft,” said West. Thomas shows others how to learn from an injury and come out even stronger than ever. Entering into a roster full of upperclassmen isn’t easy. UI sophomore golfer Rachel Fujitani rose to the challenge and she looked to her peers as positive role models. In her freshman season, Fujitani made an impact: competing in all six tournaments, carded her first under-par round and tied for 13th at the Arizona State Invitational. “Fujitani seems really committed to her craft and could make big changes in collegiate golf,” said Szarkowicz. She was named Big Ten’s Golfer of the Week by the Big Ten Conference last April, the first honor of her career. However, these weren’t her first accomplishments in the sport. In high school, she won the Washington Individual State Champion as a freshman at Hamilton High School, and continued the winning streak as individual runner-up her sophomore year. Her first season at Iowa shows how challenges can be used in your favor if given the right swing. When you leave for college, you say goodbye to your family. Karson and Konner Sommer refused to do this. Instead, Konnor followed his brother to the University of Iowa. They both joined the cross-country team. As siblings, they lean on each other as driving factors towards success, setting challenges for the other. Karson is a two-time Academic All-Big Ten honoree, placing fourth at the Iowa Open and fifth at the Larry Wieczorek Invite all before Konnor joined the Hawkeyes. Konnor’s wasting no time keeping up and challenging his brother by competing at the Hawkeye Invitational, Woody Greeno Invitational and Joe Piano Notre Dame Invitational. “To me, Karson and Konnor are like Shaquem and Shaquill Griffin: both really talented but ones got a little more experience,” said Szarkowicz. Keeping the competition in the family, these Hawkeyes will continue their stride in success. Parker Hesse’s dad saw major football potential in Parker before he did. Hesse played baseball during his time at Waukon High School, but his dad mapped out a different plan. In 2013, his dad signed him up for Hawkeye football evaluation camps. Coaches immediately noticed Hesse’s potential as a football player and teammate. “He’s from my hometown. A pretty humble dude…. Easy to talk to,” said University of Iowa sophomore Carter Leiran. So far, he’s made 173 tackles, 16 sacks and nine quarterback hurries, earning Hesse one of the most productive careers in Iowa history. He even switched from a linebacker to defensive end during his freshman season. No matter what position, you’ll want Hesse to have your back or block 150 pounds from tackling into you. Do you back down from your sport or step up and defy the odds? O’Shea Wilson chose to not wonder about how a two-year ankle injury and surgeries would affect his career, but instead on how it would fuel it. That said, as a senior and with only a handful of events left, Wilson is determined to end his collegiate career on a good note. 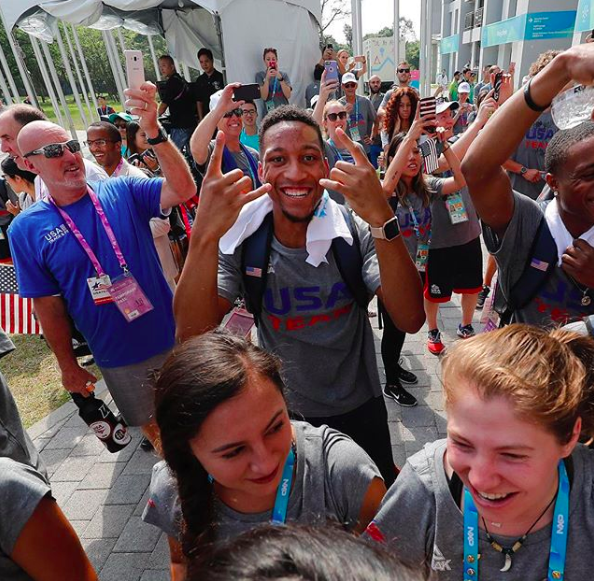 “Leading the team in both indoor and outdoor long jump is really inspirational,” said West. With his career at Iowa ending, he chooses not to focus on the “what if’s.” Wilson learns from his past but focuses on the future—where he envisions a post-collegiate track and field career. After all, if you’re headed somewhere you might as well hit the ground running. Wolf Scooters wants Hawkeye student-athletes to have an affordable and awesome way to navigate campus with a stacked schedule. Never waste time looking for a parking spot again. This article is sponsored by Wolf Scooters. A sophomore at the University of Iowa majoring in English. Looking to find a career to get paid for reading!